Hostal Azahar Cordoba i Córdoba, Spanien: Reservér nu! 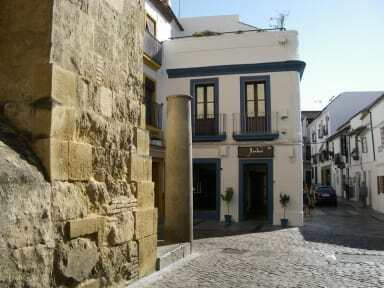 This singular and charming property, which is place just a few steps from the Mosque-Cathedral, offers you the chance of knowing Cordoba from the heart of its most characteristic quarter, la Judería (declared World Heritage by UNESCO in 1994). You will have the opportunity of getting lost in its narrow streets, breathing the scent of its flowers and enjoy its rich gastronomy. We have rooms with a simple Andalusian touch, comfortable and which offer all the services needed for having a wonderful stay with us. 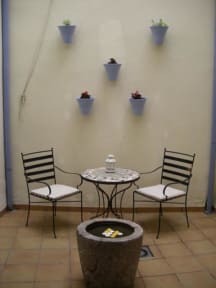 Our Cordoban patio is a perfect place to have a coffee or tea and chill out after a busy tourism morning. The property have a friendly and dedicated staff, always willing to help you and to share with the clients the charms of this city. Payment accepted on arrival : cash, credit and debit cards. Check-in time : 14.00 - 22:00. Check-out time : 08.00 - 12:00.